Where are you starting your tour? Only a few free hours in your Las Vegas vacation? 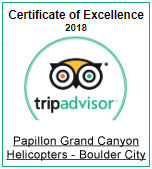 This Grand Canyon helicopter tour will fit in perfectly! 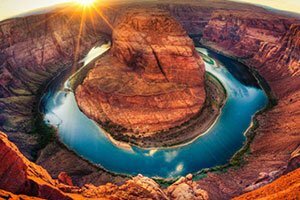 Departing from our private heliport in Boulder City, this tour includes aerial views of both Hoover Dam and Lake Mead before reaching the spectacular Grand Canyon West. 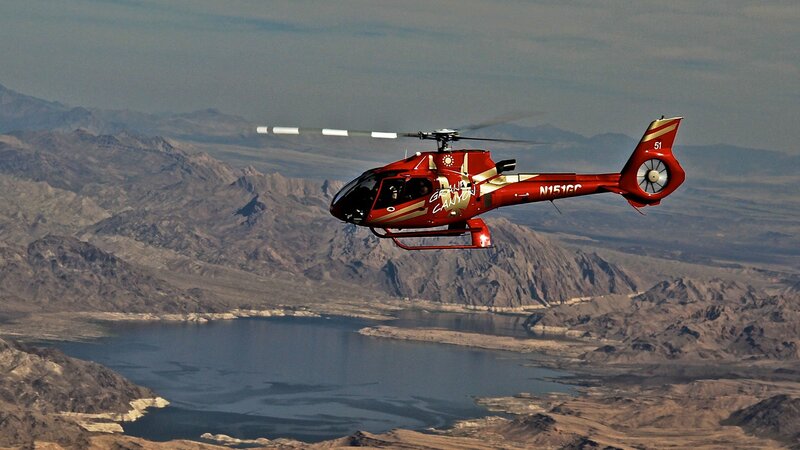 Your scenic journey is hosted aboard one of our luxurious and comfortable helicopters featuring with wraparound windows. These aircraft have been designed from the ground up for sightseeing and feature a nearly 180-degree field of view, passenger-to-pilot communications, and choreographed music through noise-cancelling headsets. 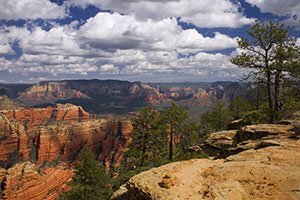 Feel the awe of soaring over the desert landscape on this exhilarating day tour. Bring your I.D. - All passengers booked on a tour must have government issued forms of identification. 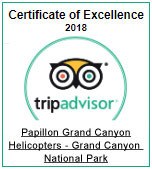 Be sure to book your tour as early in your trip as possible. Water: You may bring a bottle of water, however the bottle is not allowed to be opened in the aircraft. Don’t forget your camera! Cameras and phones are allowed and encouraged, but please be aware that the use of "Selfie Sticks" and extending camera poles are strictly prohibited in and around the aircraft. Not sure what to wear? Layered clothing is recommended through the months of March to September, and winter clothing should be worn from October to mid-March. Wear sensible shoes. 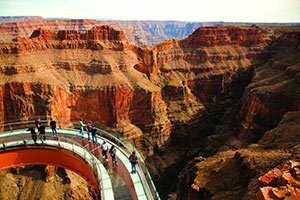 The ground at the Grand Canyon is rough, rocky and uneven. It is important to wear sturdy, toe-covering shoes that can handle rough terrain. Sneakers or hiking boots are highly recommended. Passengers are picked up from most major Las Vegas hotels. Check in at our state-of-the-art terminal facility in Boulder City. 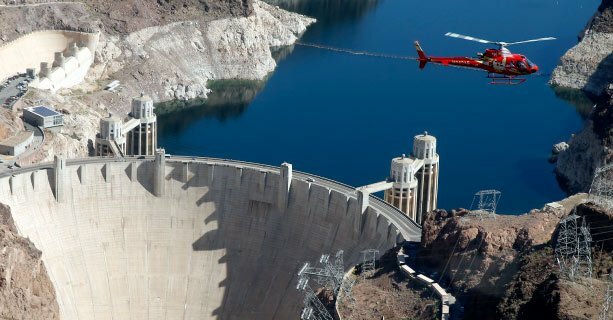 Fly over the world-famous Hoover Dam. One of the largest bodies of water in the Southwest. 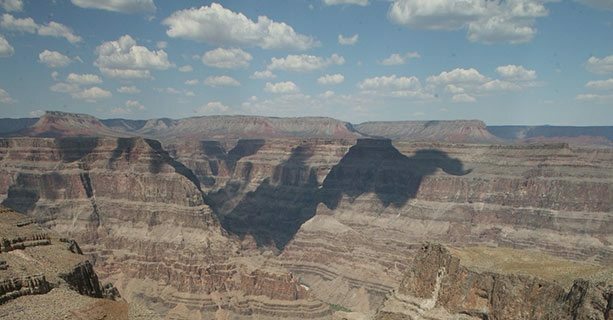 Soar above Grand Canyon West with views of Guano Point, Eagle Point, and the Colorado River. 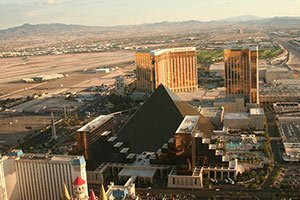 Return transport to your Las Vegas hotel via shuttle. If assistance is required for boarding and disembarking, passengers must provide companion or attendant to do so. Staff are permitted to assist only in case of emergency. Passenger must be able to use helicopter seat. Only collapsible wheelchairs with removable wheels can be stowed onboard due to space limitations. Guests will be notified at the time of check-in if space limitations will prevent their accessibility equipment from being brought onboard. 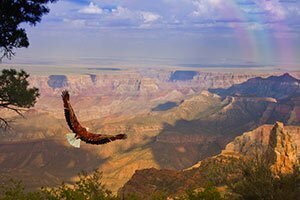 This is an air-only tour with no landing at the canyon. Should your equipment need to be left at the terminal, it will be stored safely and waiting for you upon landing. Please contact our reservations department or ask at time of booking for more information about accessible hotel-to-terminal transportation accommodations. Fly first class and experience the pilot’s point of view with a front seat upgrade for only $50 per person! While every seat aboard our helicopters provide incredible views, the front seats offers a panoramic perspective and unobstructed photo opportunities. All passengers are free to request a front seat upgrade, although availability is limited. Front seat upgrades are not guaranteed, but are assigned once the passenger check-in process is complete and seating aboard the helicopter is determined. If your request for an upgrade is confirmed, payment will be processed at the check-in counter prior to departure. PAPILLON IS PLEASED TO OFFER “SUPER SAVER” RATES FOR GUESTS WHO BOOK TWO WEEKS OR MORE IN ADVANCE. THESE RATES ARE FURTHER DISCOUNTS OFF OUR INTERNET PRICING. THE GREAT RATES COME WITH A FEW GUIDELINES. Our super saver fares are non-refundable and non-transferable. If you need to modify the product departure date and/or time, and the modified date/time is a higher fare, then the difference between the desired date/time’s fare and the original super saver fare will be charged. Modifications are subject to availability and may be made up to 24 hours prior to tour departure time. If you cancel for any reason, your payment is non-refundable. If the tour is cancelled due to inclement weather, you have the option of rescheduling to a new date/time at no charge or may receive a full refund.